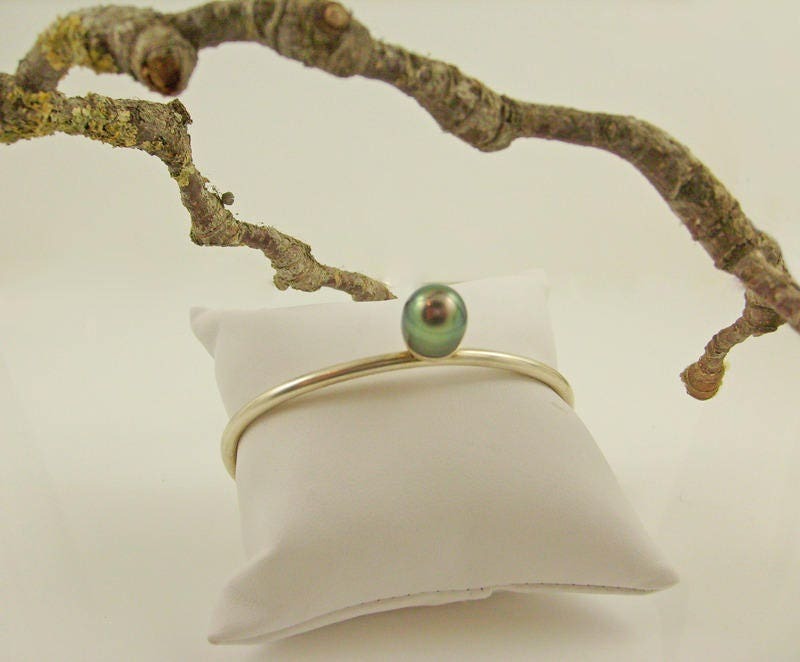 Tahitian Pearl and 925 sterling silver Bangle Bracelet. Reproduction of this same piece will never an identical replica given the uniqueness of the Tahitian semi Baroque pearls (each unique due to its shape and color), giving birth to unique every time. Finally, its implementation making at your request, it requires a few days for production before delivery. Thank you for understanding! If, for any reason, your purchase from Katell Jewels is unsuitable and you wish to return the goods, you must inform us within 3 days of receipt of your purchase. Goods must then be returned within 7 days of receipt for a full refund or exchange, excluding any postage charges. Your purchase must be unworn and received in perfect condition in the original packaging. Upon receipt of the goods in accordance with the above, we will issue a full refund or an exchange credit, as required. We strongly recommend that you return your purchase fully insured through the Royal Mail Special Delivery service or international equivalent, as we cannot accept any responsibility for any returned items that are lost or stolen. If an item arrives damaged, please inform us by email within 3 days of receipt for a replacement or full refund. I use a trackable shipping service. Please allow a few days for the production of the pieces before being sent them. The delivery of small pieces should take between 3 days and 1 week, and the one of bigger and more sophisticated pieces should take between 1 and 2 weeks. All designs remain property of the designer and cannot be copied for personal or commercial use. Many items include gold plating which is a semi permanent finish which may ware down over time. Please take note of contact details of the designer as all pieces can be returned in the future to have plating retouched if required. This service is free of charge. Sterling Silver mini earrings "The secret"
Earrings silver reticulated rounded "Curves"